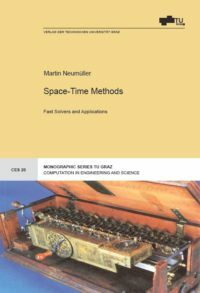 In this work numerical methods for solving time dependent problems are studied. In particular a discontinuous Galerkin scheme will be applied in space and time, by decomposing the space-time domain into finite elements. For the heat equation, as a model problem, an error analysis will be given and numerical examples confirm the proven estimates. Based on this space-time discretization scheme a hybrid formulation will be derived, which allows the use of parallel solution algorithms. Moreover, an error analysis for this hybrid discretization scheme will be given and numerical examples agree with the proven convergence rates. In the main part of this work the convergence of a space-time multigrid method is studied. For this method the two-grid cycle will be analyzed by using the local Fourier mode analysis. The theoretical convergence rates of this method are confirmed by several numerical tests. The parallel application with respect to time is one advantage of this multigrid approach and the parallel performance of this method will be shown. At the end of this work these space-time discretization schemes will be applied to the Navier-Stokes equations, where also the expected convergence rates will be obtained. Finally, to show the advantage of these methods, the flow of a two-dimensional pump will be simulated.